Skyline Magazine Online	--- Assam's First web Magazine. Hindustan Ambassador - The King of Indian Roads. WLAN its advantages and disadvatages. Edition 109th - December 2013. Skyline Magazine wishes all its readers, members, workers and well-wishers a very happy and prosperous new year 2015. May the coming new year bring you lots of joy, success and luck. The King of Indian Roads. Recently I watch a television show called Wheeler Dealers Trading Up where Mike Brewer (the presenter) bought a Hindustan Ambassador (nicked named Lucky) and exported it back to UK where he sold it with a profit. Watching the show made me nostalgic about the wonderful time I spend with my father’s Ambassador. Before I share my nostalgic moments I would first like discuss the history of this wonderful machine. One can surely say that this iconic car has been used from an ordinary person to Prime Minister of this country. Before introduction of modern SUV’s Ambassador was the only car strong and powerful enough to be modified to carry bullet proof protection. 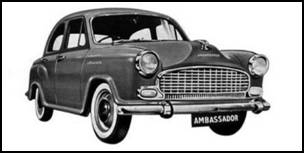 Hindustan Ambassador (Ambassador) was first introduced in Indian roads in 1958 and was manufactured by Hindustan Motors (HM). 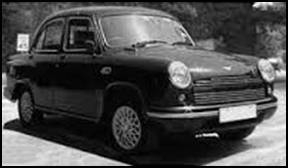 This car is considered as the “King of Indian Roads” and is affectionately called the “Amby” The Mark I Ambassador or simply called the Hindustan Ambassador was basically The Morris Oxford Mark III made around 1956 to 1959 by Morris Motor Limited at Cowley, Oxford. 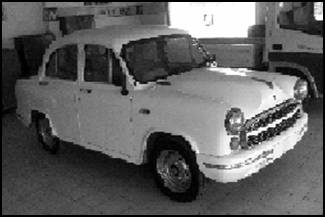 In 1957 when Birlas commissioned the car all the tooling of the British Morris Oxford Series III was transferred to India. The car was renamed as Ambassador and series-production started in 1957. The car had a 1476 cc side-valve petrol engine. In 1959 the side-valve engine was replaced by a 1489 cc, 55 bhp overhead-valve BMC B-series petrol engine. In 1963 Ambassador underwent a minor frontal facelift with a modified grill and was named as the Ambassador Mark II. 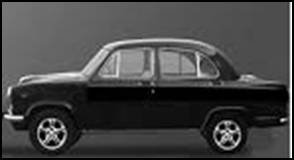 As with other British designed Mark cars, while there was never really any Ambassador Mark I, the arrival of the Mark II got people calling the older model, Mark I. Incidentally, the first ever produced Mark II in black was gifted by HM to the then Prime Minister Jawaharlal Nehru. My father’s car is also an Ambassador Mark II car which I am going to discuss later on. 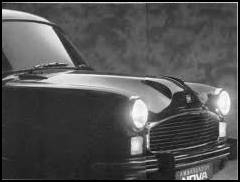 In 1975 Ambassador under went yet another minor facelift to the same grille and a much bigger frontal facelift, with a new dashboard all in black, new tail lights, number plate light and rounded parking light. 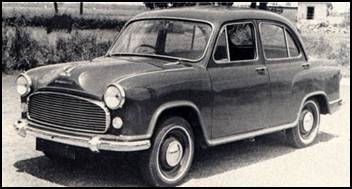 The new car was known as the Mark 3, the most popular face of the Ambassador. By 1978, the Mark 3 was available in its Standard and Deluxe versions. The Deluxe version had a newer dashboard with four meters plus the speedometer. In 1979 Ambassador got another facelift with a smaller grill and square parking lamps and separate blinker lamps incorporated on the semi front lip spoiler below the bumper. This model was named as Mark 4. In addition to the existing petrol version, a diesel variant was launched which was powered by a 1489 cc, 37 bhp BMC B-series diesel engine. 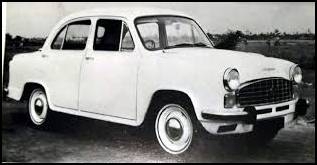 It was the first diesel car in India and was well received by the Indians. Mark 4 was the last of the Mark cars. For a short period the cars were available as "Deluxe" & later it was renamed Ambassador Nova. The Ambassador Nova was launched in 1990 in two variants—a 55 bhp petrol-powered Deluxe version and a 37 bhp diesel-powered Diesel DX version. Ambassador Nova had a newly designed steering wheel, new steering column, better brakes and electricals. It also had some cosmetic changes which included a new radiator grille. Foot gear lever was also introduced and had replaced the steering column type hand gear lever. In an attempt to increase its appeal, in 1992 another version of Ambassador was released. Named as Ambassador 1800 ISZ, this model featured a 75 bhp 1800 cc Isuzu inline-four cylinder engine and a five-speed manual gearbox, and also had the option of bucket seats, as opposed to the earlier traditional bench seats. Also, the entire dashboard was redesigned. Instrumentation panels were shifted from the centre of the dashboard to the right, behind the steering wheel. Seat belts became mandatory. Incidentally, HM was on its toes after the mid-1980s after the assassination of Prime Minister Indira Gandhi in 1984 and the impending terror threat to the new leadership, coupled with the inclination of the Indian political class to use the Ambassador. These factors compelled the car maker to shop for a more powerful engine, which could effectively propel the car with the added weight of armor plating, with bullet-proof glass and air-conditioning as essential add-ons. The Ambassador again was re-engineered and renamed as Ambassador Classic. The new model featured a redesigned dashboard, polyurethane seats, pull type door handles. The higher end models featured servo assisted disc brakes and power assisted steering. Ambassador Grand was launched in 2003 and according to HM, the new version had 137 changes compared to its predecessor. The notable changes included body colored wrap around bumpers, camel colored interiors, fabric seats, remote shift gear lever, moulded roof and door trims, bigger rear wheel drums, improved suspension with anti roll bar, central door lock, factory fitted music system. The Grand version of Ambassador was available only in 2.0L and 1.8L engines at first and later in 2007 the 1.5L model was added to the line. The Avigo is the most radical revision of the Ambassador, a part of a brand revitalization kicked off in the middle of 2003. The change of name, a break from the Ambassador marquee, indicated a different marketing strategy. The Avigo was launched in the summer of 2004. The revitalized lineup consisted of the Ambassador Classic of mid-2003, the Ambassador Grand of late-2003. The rear of the car has been left untouched, and this leads some to feel that the car is not really different from an Ambassador. The Avigo, however, has much more classic-touch internals, like a centrally mounted console (like that of Mark 4 models), beige-colored seats and wood-grain interiors. 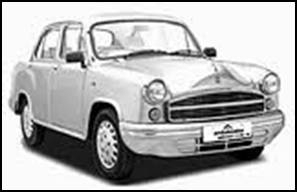 Hindustan Motors has currently halted the production of this iconic car due to lack of demand and funds. 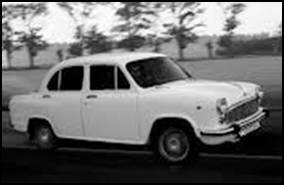 This iconic car not only completed 50 years but had it been in production it would certainly have become the Rolls Royce of India. I can say one thing you take a ride in Ambassador and you will not feel comfortable in any other car because Ambassador is truly the King of Indian Roads. It can easily ply through the bad and broken roads of India. I feel proud to be an owner of an Iconic Ambassador Mark II which is been in our family since 1974. Our car completed 40 years and is still used as daily car by our family members. Besides having three other modern cars taking a ride in this car is totally a different experience. I can say that this was the first car that I took my first car ride in and the first car to learn by driving in. Hence truly for me it is the number one car. I hope Hindustan Motors can start the production in the future and the interest grows for this wonder Indian Icon so that some day this car can again rule the Indian roads. By - H. A. Patgiri. Recently Global NCAP had done frontal impact test based on UN standards and UK standards for many leading car models manufactured in India. It was found that all the test cars failed the test due to lack of strong structure and airbags. Many of the cars are top selling Indian hatchbacks which is alarming. Now what is concerning is that when manufactures were asked about the result they simply replied that we are following the standards set by Indian Government and our cars meet or exceed these standards. So we can say that the Indian safety standards are far poor than UK or UN standards. The volume of cars and road users in India is far greater than UK. Not only that in India there are special road users also like cows and elephants, rickshaws and bicycles and God knows what; which are not seen in UK. So the Indian safety standards for Indian cars should have been at least similar to UK if not greater. What is lacking in Indian car Safety Standards? The second lacking is the ethical aspect of Indian car manufactures. Some companies whose cars failed the test exports the same models with better equipment to other countries which simply passes NCAP test with flying colours. So, safety of Indian consumers is not same as of say UK or US consumers in the eyes of these manufactures. The third lacking is simply the ignorance in the part of the Government. Government feels that increasing the standards will lead in increasing cost of the product which will lead to consumer dissatisfaction. But the point Government misses is that there is simply no price for safety. It is sad to report that in many Indian tows wearing seat belt is simply not compulsory till now. Drivers and passengers simply do not wear seat belt in highways. This kind of attitude has led to death of many innocent lives. There should be effort to invite concern experts for establishment of Indian NCAP just like the EURO NCAP. Improving the safety standards for Indian cars are all in our hands, simply ignoring them may lead to the loss of life of our near and dear once. Technologies that may enhance the safety in Indian cars. There are many technologies which can, not only enhance the safety but also save lives. Seat belts were invented by English engineer George Cayley in the early 19th century. This vehicle safety device designed to secure the occupant of a vehicle against harmful movement that may result during a collision or a sudden stop. A seat belt functions to reduce the likelihood of death or serious injury in a traffic collision by reducing the force of secondary impacts with interior strike hazards, by keeping occupants positioned correctly for maximum effectiveness of the airbag (if equipped) and by preventing occupants being ejected from the vehicle in a crash or if the vehicle rolls over. Seat Belts are made legal compulsory for UK cars a long back. Airbags were invented by German engineer Walter Linderer. An airbag is an occupant restraint system consisting of a flexible fabric envelope or cushion designed to inflate rapidly during an automobile collision. Its purpose is to cushion occupants during a crash and provide protection to their bodies when they strike interior objects such as the steering wheel or a window. Modern vehicles may contain multiple airbag modules in various sides and frontal locations of the passenger seating positions, and sensors may deploy one or more airbags in an impact zone at variable rates based on the type, angle and severity of the impact; the airbag is designed to only inflate in moderate to severe frontal crashes. Airbags are normally designed with the intention of supplementing the protection of an occupant who is correctly restrained with a seatbelt. Airbags are made legal compulsory for UK cars a long back. Anti-lock braking system (ABS) is an automobile safety system that allows the wheels on a motor vehicle to maintain tractive contact with the road surface according to driver inputs while braking, preventing the wheels from locking up (ceasing rotation) and avoiding uncontrolled skidding. ABS generally offers improved vehicle control and decreases stopping distances on dry and slippery surfaces. ABS would have been an effective tool in today’s Indian city traffic had it been made legal requirement. ABS is made legal compulsory for UK cars a long back. First traction control systems were introduced by Mercedes-Benz and BMW. Electronic stability control (ESC), also referred to as electronic stability program (ESP) or dynamic stability control (DSC), is a computerized technology that improves the safety of a vehicle's stability by detecting and reducing loss of traction. When ESC detects loss of steering control, it automatically applies the brakes to help "steer" the vehicle where the driver intends to go. Braking is automatically applied to wheels individually, such as the outer front wheel to counter over steer or the inner rear wheel to counter under steer. Some ESC systems also reduce engine power until control is regained. ESC does not improve a vehicle's cornering performance; instead, it helps to minimize the loss of control and increases safety. ESC has been made legal requirement for all new vehicles in UK since 2012. Pedestrian Airbag system has been developed by Volvo Company. This system is just like any other airbag system. The pedestrian system is based on a sack and a gas hybrid generator that’s responsible for filling up the sack with gas according to information sent by the ECU. The system effectively works at city speeds. Advanced Emergency Braking System (AEBS) or Autonomous Emergency Braking (AEB) is an autonomous road vehicle safety system which employs sensors to monitor the proximity of vehicles in front and detects situations where the relative speed and distance between the host and target vehicles suggest that a collision is imminent. In such a situation, emergency braking can be automatically applied to avoid the collision or at least to slow down to minimize damage. Driver Alert System (DAS) is a system created by Volvo Company. If the system concludes that the driver is drowsing, it issues an audible alarm, and an icon depicting a cup of coffee flashes on the instrument panel. Similar system is Driver Attention Warning System which uses a voice alarm. If a driver is nodding off, the car announces verbal alarms. The driver's seat is also vibrated to help arouse the driver. There are even more technologies under development which will make car driving a lot safer and minimize if not eliminate increasing number of road accidents. But it will be on the part of enforcement agencies, car manufactures and consumers to see that these technologies get implemented in newer vehicles. Global NCAP tests also revealed; failure of the car’s structure due to lack of structural strength. This is also a concerning issue as manufactures are cutting corners in body design and manufacturing in the name of fuel economy and manufacturing costs. The enforcement authorities should take this matter very seriously and enforce necessary steps to improve structural integrity. Why can’t the Indian cars be as good as the Germans and Swedish in name of safety and build quality? The manufactures should look into the matter as India is becoming a major player in global car market and that lives Indian or Non-Indian are same and precious. WLAN short for wireless local area network is a very simple concept of networking your computers. The concept of Wlan is simple because you don't require wiring the whole building and you don't require maintenance of the cables also. For wireless networking your personal computers should be installed with wireless network cards which are now a days available in Indian markets in cheaper rates. You will also require wireless access points to allow wireless networking. If you want to allow wireless service in a single floor depending on the distance on or two access point will do. WLAN is simple to setup and maintain but its security is a concern. As there is no physical restrictions to wireless signals any one can enter in to your network without your knowledge. There are special security methods available like WEP, but still they have their limitations. Now a days the concept of wireless is getting importance for its advantages but only time will tell for sure about its existence. To improve the security of your WLAN Wireless access keys should be always changed regularly to prevent unwanted access as well as firewall should be installed in the server also. Hence we can say that a wireless network has advantages as well as disadvantages.